I have resisted buying any Bose products for a long time. I have had tons of other headphones that were uncomfortable and that hurt my head and ears. I have a drawer full of headphones that either have a short in the fixed wired cables or simply sound bad. I have at least one other noise canceling headset that literally do not cancel out any noise; there is no audible difference heard after the switch is turned on.If I added up the money that I've spent for all those bad headphones, I could have the Bose® QuietComfort 15 Acoustic Noise Cancelling® Headphones - Limited Edition a long time ago (maybe even two sets). I actually visited the Bose store at the Great Lakes Crossing Mall and tried out the Bose QuietComfort 3 Headphones , which are the "on the ear" style of headphones. The Bose QC3 has a built-in rechargeable battery which is very nice. I decided I liked the Bose QC 15's "around the ear" feel a little better, so I would deal with disposable batteries. I am not an audiophile, but I enjoy my music. I have over 2,000 songs on my iPad, my iMac and iPhone. I listen to even more music on the Pandora app. I love listening to my music without limits. Sometime I like blasting my music throughout the whole house via the Apple TV and my surround sound home theater system. Other times, I use my Jambone Jambox to keep my device on the charger while I carry the speaker from room to room. Still other times I like the music to be personal and streamed directly and personally into only my ears. I have never liked Apple's included earphones; the old ones or the new ones. Wearing Apple's version is like wearing two sticks in my ears. The Bose QuietComfort 15 Headphones are like having soft pillows on my ears. Two soft pillows that emit awesome music and/or audio, that is. I spend my most of my time listening to podcasts on my iPhone using the Stitcher Radio app. Podcasts satisfy my listening pleasures, as well as, offer a convenient way for me to stay informed of my topics of interest. I also enjoy watching movies and watching episodes TV shows on my mobile devices. 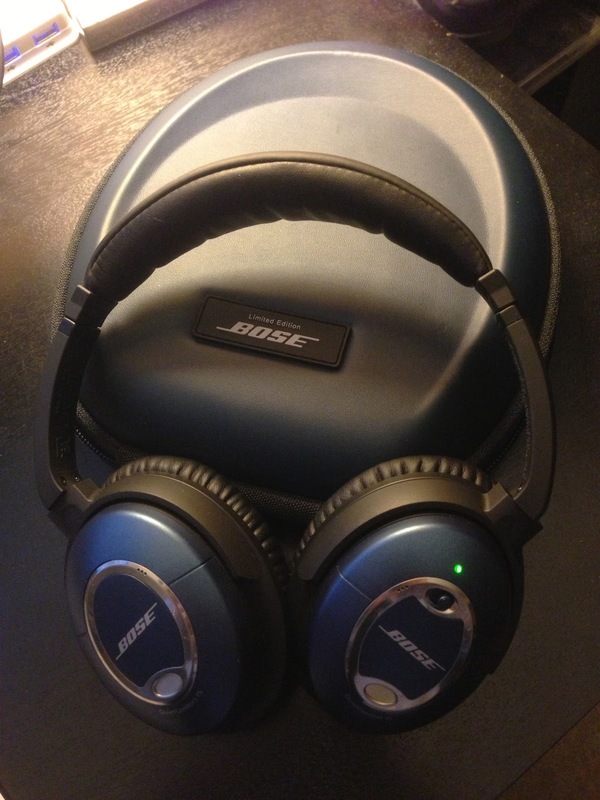 The Bose QuietComfort 15 Headphones are a wonderful addition to my world. They sound beautiful and are so comfortable thatI hardy know I am wearing them. I am tender headed and most headphones hurt the top of my head (especially more that my head is less covered with hair these days). I enjoy watching movies as well. I have many options for viewing movies on my iOS devices. I use the Crackle app, the Hulu Plus app and the Netflix app to stream content from the Internet. I also have my own movies on my Seagate FreeAgent GoFlex 1.5TB USB hard drive and mounted on my iMac 21" desktop computer. I stream these movies to the iPad and iPhone using the AirVideo app for iOS. Additionally, I stream the same movies to my Jailbroken Apple TV and to my Roku streaming device, but I don't use the Bose headphone on the TV sets. I do them if I watch the movies or training videos directly on the iMac. The Limited Edition has a Blue Leather case. I am always listening to something in my spare time. I also enjoy listening to audio books through the Audible.com (an Amazon.com company) app on my devices. Let's not forget that I love playing games on my iOS devices. Whether I am playing Kingdom Rush HD, Asphalt 7, Need for Speed - Hot Pursuit (I haven't tried Need for Speed™ Most Wanted yet, but I want to soon), The Walking Dead - The Game, Plants and Zombies HD or Osmos for iPad; it just sounds better with the Bose QuietComfort 15 headphones. I elected to get the limited edition Blue version of the Bose QuietComfort 15 because a splash of color never hurt any gadget. It would have been better if it was red; maybe a Product RED version? That would be nice! But the Bose®- Limited Edition QuietComfort® 15 Noise Cancelling® Headphones - Blue is a nice looking addition to any gadget collection. Why get the one everyone has? The blue version is much better looking to me than the normal silver version. The blue color was added to both the headphones as well as to the carrying case. 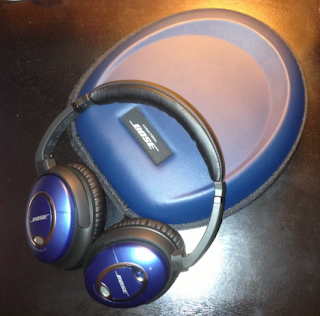 It is very peculiar that neither the Bose site nor any of the other reviewer of the Limited Edition version of the QuietComfort® 15 Noise Cancelling® Headphones mentioned the blue leather carrying case. Not sure if it is real leather or not, but it is a nicer look and feel than the black standard non-leather like carrying case. The Blue Limited Edition looks nice. Built in moldings protect the cushions' shape. 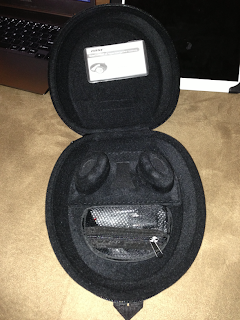 I love these headphones and I couldn't wait to use them on my daily commute to and from work. I ride the commuter bus to and from work; about 45 minutes to an hour each way. 99% of the riders are professionals with a few students here and there. The crowd is fairly quiet, but we all from time to time get pretty chatty. It is nice to be able to just erase all of the conversation from the ride; with the help of the Bose QuietComfort 15 headphones. Just turn these babies on and every outside sound just cease to be heard. It is surprising how much noise is generated from the bus and environment alone. The bus hums, squeaks and beeps without much help from the passengers. The traffic noise alone is annoying once you have lived without hearing it. Sometimes I think, for a quick second, about not taking out the Bose QuietComfort 15 headphones and just using my normal ear-gear. That thought doesn't last long. It is easy to get spoiled quickly with these headphones. It is very nice to just put the headphones on, turn on the power and enjoy the peace; even without any music or audio playing. Sometimes I put on the WhiteNoise Pro app and just listen to the train sound. Other times I play the white noise sound and read a book or catch up on the news from the Flipboard app or the Zite apps. Typically I listen to my audio via my LH HBS-700 Bluetooth wireless headphones. They are the headset I use when I am mobile. When I am stationary for even just a little while, I prefer the Bose QuietComfort 15 headphones. The Bose QuietComfort 15 headphones have very nice sound quality and the noise canceling feature is topnotch. With winter here in Detroit, I sometimes just wear the Bose QuietComfort 15 headphones as my earmuffs. A few days ago, my family was decorating the Christmas tree as I type this review and I couldn't hear any of their constant chatter; except very faintly between songs. With a wife and two preteens girls, I finally have a escape that doesn't remove me from the room. You can put on any pair of headphones and blast them into your ears to block out any noise. Of course that is not enjoyable to the person with the headphone on or those around them. Setting the volume at about 25% on my iPhone 5 is a very comfortable level to listen to my music when at home while the family is watching television. My daughter was sitting directly next to me and could not hear my music until I went one notch over the 50% volume level. Other $299 headphones, that I've tried, claims to block out noise, but they don't. Those other headphones blast your ears with high volume to be louder than the other noises around you. The noise canceling is obvious the very second you place the Bose QuietComfort 15 headphones on your ears. Even without the music playing, you will be aware of the removal of the sounds around you. It focuses on certain sounds to cancel them. I can have the TV on and turn the headphones on and I can hear the voice from the TV without the other noises in the room. It is wild. The Bose QuietComfort 15 headphones are nice looking. The have a very sophisticated or distinguished look to them. The Beats and other headsets add color to their headphones or boost the Bass to appear hip and youthful (the opposite of crowd I believe the Bose brand tries to appeal to). The $299 price of the headset can not be considered a cons because most of the headphones that would compete with this headphone in the open market are priced the same. I tried all of the above out before I settled on the Bose. 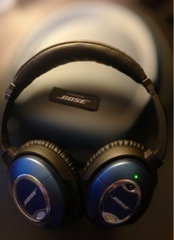 I felt the Bose satisfied my need for a comfortable, great sounding headphone with fantastic noise canceling. I liked that the Parrot Zik had touch controls and was wireless, but I couldn't justify the extra $100 for those two features. The sound and noise canceling would have had to have been considerable better. They weren't even at the same level. The only complaints I could muster up is the fact that the headphones are totally unusable when the battery is dead or not present. Bose does include a battery with the purchase. It is nice that it only requires a single AAA battery, but it is a bummer that the headphones do not offer an auto-off feature. I have fallen a sleep with the headset on and the battery continued to drained through my fast. It would nice if there was a switch to have the headset turn itself off after a certain amount of time. 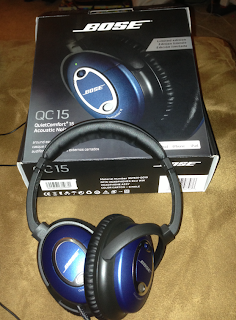 I am extremely pleased with the Bose QuietComfort 15 Acoustic Noise Canceling Headphones. I would recommend them to anyone wishing to have a pair of comfortable, nice sounding headphones that block out the unnecessary background noises to allow the audio content to be enjoyed. headphone please contract with us. I'm sorry but I have to say that you are wrong about the sound quality. Basses are missing, sound is definitely not rich! I clearly admit that the noise concelling is astonishing, however, these are also headphones, and they totally missed that part. My bose In ear headphone have a lot richer sound.